Can’t miss a Notre Dame Dame? Have an iPhone or iPad? Good. Say it’s Saturday afternoon, the Notre Dame football game is about to kick off in South Bend, and you’re stuck at wedding reception, soccer game, or some other event without access to a TV. If you have an iPhone, or happened to bring your iPad with you, you’re in luck. 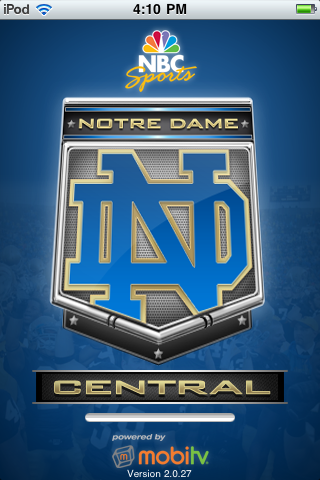 The Notre Dame Central App for iPhone and iPad allows you to watch all Notre Dame Fighting Irish home football games live. The App is free to download, but some of the features, most importantly the live steaming video of Irish home games, requires a fee. 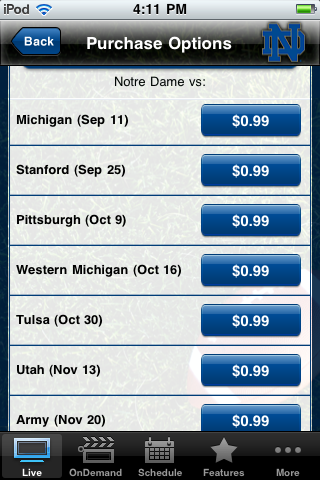 A single game will cost you .99 to watch live, or you can get the entire season (7 games) for $3.99. You get a very basic live scoreboard, schedule…. … news, video highlights and some classic game footage. When I say basic scoreboard, I mean a BASIC scoreboard. All you get is the the scoring by quarters. To get game stats and Score Summary you need to purchase at least on of the live video packages. As we mentioned, watching live games will cost you .99 for an individual game or $3.99 for a season pass. 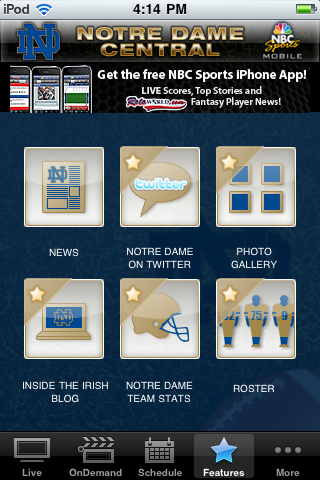 Paying for a live game will unlock Notre Dame on Twitter, Inside the Irish Blog, Photo Gallery, Stats, and Roster. iTunes reviews of the live footage on the iPhone have been positive. Without a live game purchase, there isn’t much too this app. Although the video highlights and classic games footage is nice, there are certainly plenty of other places to go for better live scoring and a Notre Dame Football schedule. 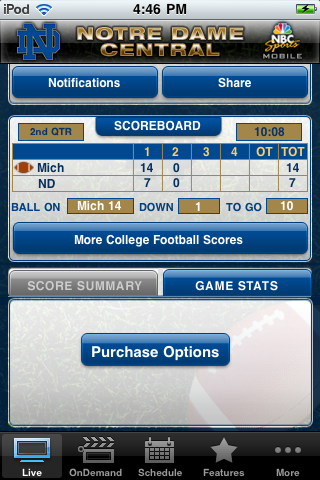 If all you want is free scores and stats, the ESPN ScoreCenter App is a better choice. 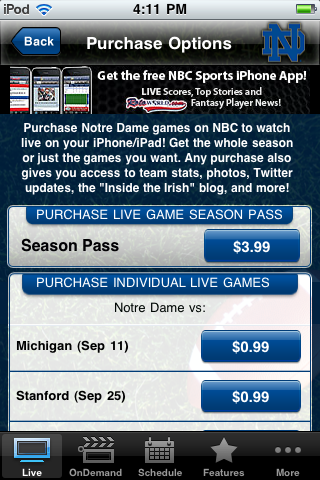 On the plus side, the .99 per game or $3.99 for a season pass to watch live home games is a bargain for any Fighting Irish faithful who find themselves away from a TV during a game. You may even be willing to pay for the live games just to unlock the other features that aren’t included for free. Fans will also want to note that since the live footage is only available for home games, you won’t be able to watch Boston College, Michigan St., Navy, or the USC games. If can’t watch on your TV at home, or you’d rather not watch on an iPhone, you can also watch the Irish live online at NBCSports.com. If that’s no good, then try the Sports Bar Finder App for iPhone and Android.